Europe is in turmoil. The lands are fragmented into petty fiefs and the Emperor struggles with the Pope. At this very moment the Pope has declared that those who go to liberate the Holy Land will be freed of all sins. Gather prestige and piety and the world will whisper your name in awe. Will you co-opt other monarchs, and the Pope, under your leadership to liberate the Holy Land? 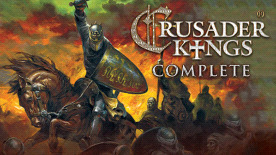 Do you have what it takes to become a Crusader King?